How to adapt voice search in your SEO strategy and what are we doing for Voice Search Optimization. Voice Search is undeniably growing at a rapid pace, and for good reason—it’s fast, it’s convenient, it allows you to search on the go, and it’s becoming part of almost every device that consumers are using. It has taken a good percentage of total searches across the world, in part due to AI assistants like Apple’s Siri, Amazon’s Alexa, Google Assistant, etc. With mobile impacting desktop in terms of search queries, and home automation devices becoming mainstream, voice search will power many future local search queries. Optimizing for voice search conversational terms will be a key differentiator. The good news is that we already have services in place according to Google’s priorities such as surveys and widgets to boost customer reviews in Google, Yelp and Facebook. We were one of the first agencies to adopt Voice Search optimization, wherein the content we create is more conversational and matches users’ natural language pattern. Verified and Accurate Google My Business Listing – Most voice search queries will ask for directions to your business address, so we will make sure that your business is listed accurately on Google Maps. Without verification, it would be really difficult to rank for voice search queries. NAP (Name, Address, Phone) Consistency Across Local Sites – Accurate map listing, in terms of name, address and contact number, across multiple map databases will also help search engines to be more confident about your location, and it will form part of the ranking algorithm. We will ensure that your business information (NAP details) is consistent across other top tier and second tier local search engines, directories and review websites. Generating Positive Reviews – Customer reviews are a critical part of the ranking algorithm for voice search. We can help you get positive reviews on Google and Yelp for your business via our proprietary Plug and Play Review Widget and Survey Review Booster. Mobile Friendly Website – Since most voice searches are done on mobile devices, you MUST have a mobile-friendly site. If your website isn’t mobile friendly, we can help you set up a mobile friendly version with the help of our experienced team. Conversational Content – Mobile voice searches will use natural language, which means long-tail keyword phrases are more important than ever. A way to add natural language to your website is by using words and phrases that people actually use (versus a formal register, which is usually not very commonly used online). The content used will be more conversational in tone, and the keyword phrases will probably resonate more with a person performing a voice search. We have already started implementing this for website content, which will help the site rank for voice-based queries. Microdata & Advanced Schema Markup – Google will start using schema markup both as a site quality and richness indicator (i.e. affecting rankings), and for creating carousel-like results for certain searches, with Knowledge Graph-like summary data on each result in the list. We will help you set up structured data on your site. Rank Tracking – We have already started tracking rankings in mobile search results for voice based terms like “near me”, “close to me”, “around me”, etc. around physical location across all verticals and reporting these rankings on our dashboard. Google My Business itself is not a public-facing, searchable directory (such as Yelp), BUT, your listing on Google My Business is what many other public-facing, searchable directories pull from. This includes Google Maps, which has become its own hybrid form of a review site/business directory/navigation service. Your Google My Business listing can also impact your rankings in search results on both Google Maps and regular Google searches. Here’s how you can optimize and take full advantage of your GMB listing. The first step is to set up (or claim) your Google My Business Listing. Go to the Google My Business page and click “Start Now” in the upper left corner. Did you know that anyone can list your business on Google? That’s a little scary, but fear not—you as the owner can claim your listing, which grants you the access to edit and update your information, to post timely information, and to manage reviews. The claiming process requires a few steps, but it is a must. Business name: The legal / official name of your business. Address: Full address of your business. Phone number: A number with a local area code is recommended. That’s one extra signal to Google that you are actually local. Make sure the number you use for your Google My Business listing is also displayed on your website. Category: Choose a relevant category. This will help Google decide which searches your local listing belongs in. Hours of operation: The hours your business is open. For days when you have unusual hours, like holidays or special events, you can set special hours. Description: What you offer, what sets you apart, your history, or anything else that’s helpful for customers to know. Allowable limit is 750 characters. Keep in mind that only the first 250 characters show up in the Knowledge Panel, so prioritize your information. Finally, no links or HTML. Photos: Showcase your products and services to people who are looking for what you offer. Consider hiring a Google approved photographer to create a 360-view virtual tour of your business for customers. According to Google, listings that have a virtual tour and photos generate twice as much interest as those without. Depending on your industry, there may be additional fields such as menus for restaurants. One thing Google’s algorithm looks at to verify the legitimacy of a listing is a consistency in how it’s listed across different websites. While that seems simple enough – your address is the same each time you enter it somewhere – it’s easy for little differences to slip in. Maybe you wrote out the Road part of the street name one time, and shortened it to Rd another time, for instance. Pick a standard way to write out your address, a consistent phone number to use, and make sure all your listings match both each other and the information you provide on your website. And work on getting your website listed in as many relevant directories as possible. Any work you do to optimize your website or local listing will be for naught if you incur a penalty. Google suspends business listings for a range of different offenses. Getting suspended is stressful, confusing and bad for business, so it’s best to avoid doing anything that puts you at risk of it. Using a URL that redirects to your website’s URL, rather than the actual URL itself. Trying to awkwardly add keywords into your business name field. Having multiple local listings for the same business location. Use common sense and don’t try to play the system or get extra listings, and you’ll probably stay on the right side of Google. You’ll notice that the local businesses listed in the map snippet of a local search usually have star ratings next to their name. Google wants to provide the most useful information to its users, and users want to find the nearby business that seems the best. In both cases, it benefits your business to have a high star rating. Ask your happy customers to take a few minutes to give you a review on Google. Include an encouragement on promotional products. A gentle nudge or a reminder of how much it means for your business can make your loyal customers that much more likely to take the time to say a few kind words about you. Utilize our proprietary Dashboard Review Widget as well as our Survey Module to get positive reviews for your business listing on Google and Yelp. All the usual SEO advice that helps strengthen the authority of your website in the eyes of Google matters here too, so don’t focus on optimizing just your local listing. Optimize your website as well. Incorporate relevant keywords into the meta tags and copy on each page where you can do so naturally. Add schema markup to your website. Create content with a local focus, i.e. locally relevant landing pages. Look for local linking opportunities. A strong website that’s optimized for both your customers and search engines will be that much more likely to make it into the list of the top three in a local Google search. Questions & Answers is a great feature for Google local search. It’s very cool! Just like it sounds, Q&A allows people to ask questions about your business and you can answer them. The Google My Business Q&A feature is the perfect opportunity for you to hear directly from “the people” and for them to hear form you. Win-win. One thing you should do is to be proactive and create a Frequently Asked Questions list to preempt people’s GMB Q&As. Check with your sales reps and your customer service staff to identify the questions people most often ask, then put those Q&A questions on your GMB listing. When making a purchase decision, people look to others for their opinions. We all do it. And we do it often. We want to learn from the experiences of those who have purchased before us. Always respond to your reviews. Positive reviews give a good impression of your business and should be easy to respond to. But what do you do about the inevitable 1-star rating and the scathing negative review? Many businesses shy away from them, hoping they’ll go unnoticed. But you need to respond to those reviews. The people leaving them deserve it, and the people reading them need it. There are many ways customers can find your business, but there is no denying that Google My Business is an incredibly powerful gateway to your website. It positions your important business information in front of the eyes of potential customers who are looking for your product, service, or experience. Google is slowly moving features and data from the old Search Console to the new one. However, not everyone is happy with the way data is presented within the new search console because many reports are missing from it. However, Google has promised that all the data will be available in the new version as well. Google announced via a tweet that reporting features for AMP, Index Status, Links, Manual Actions, Mobile Usability, Rich Cards, and Search Analytics have been successfully moved to the new Search Console. Here’s a table that shows which reports have been moved, where to, and what are they called. Search Analytics Performance New report has 16 months of data and is much easier to use. Rich Cards Individual Inhancement Reports New reports provide detailed debugging information, and a one click request to recrawl fixed issues. Links to Your Site Internal links Links New report combines both Links to your Site and Internal Links report, with more reliable link count numbers. Index Status Index Coverage Status New report provides all the information of the old report, plus detailed crawl status information from Google Index. Sitemaps Report Sitesmap Similar information, but better designed report. The old report supports testing a sitemap without submitting it; the new report tests only upon submission. Accelerated Mobile Pages AMP Status Many more error types reported in the new report, plus a fix flow to request reindexing of fixed pages. Manual Actions Manual Actions The new report shows your manual action history, including review requests and results. Fetch as Google URL Inspection Tool The URL Inspection tool shows information about the indexed and live versions of a URL, and provides the option to request a crawl. New information includes the URL of the canonical page, any noindex/nocrawl blocks, and whether the URL is in the Google index. Mobile Usability Mobile Usability Similar information, but in a more usable format. Also provides a fix flow to request reindexing of pages with fixed mobile usability issues. Takeaway: Google search console is one of the most powerful marketing tools out there that provides you with invaluable data. If you are not using it yet, then we highly recommend reading this guide on how to get your website on Search Console and start utilizing this powerful tool to its fullest. If you are already using the new Search Console, the above table will help you locate old reports. It may not be easy to get used to the new Search Console after using the old one for years, but as we all know, the only thing constant in the digital world is change. So, try get used to the new interface and use it to your advantage. 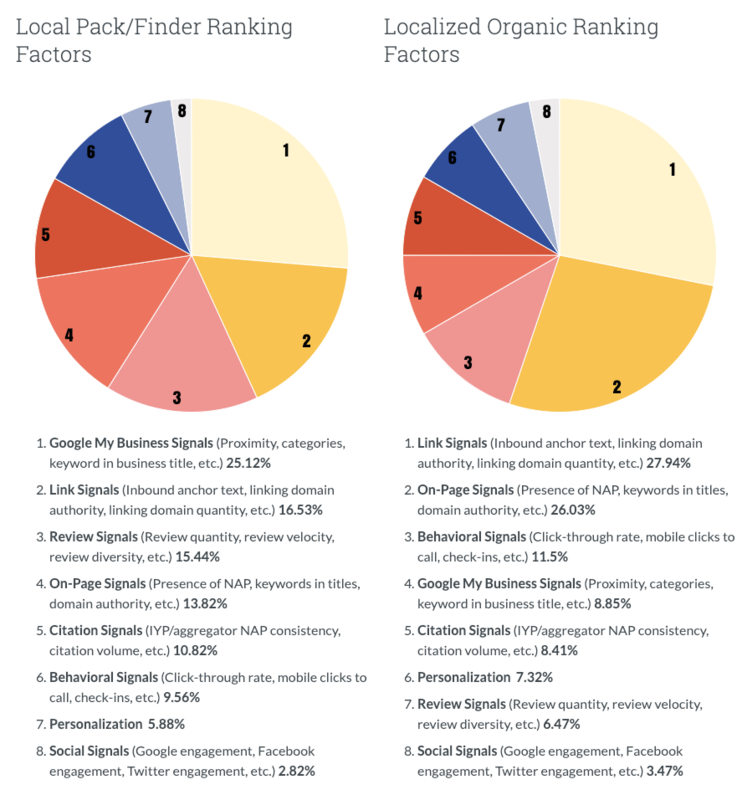 Moz released the 2018 local search ranking factors last month and they reveal a lot about the upcoming big changes in the world of SEO. If you are looking for accurate predictions, or just want to stay updated about current trends, we recommend reading it. 2018 was a good year for local SEO as we witnessed a major boost in the rankings of the local players instead of the corporates. This just solidifies the fact that no matter your size, if your site has what it takes, then there’s no denying that you can beat mega corporations. Keep in mind that this survey was conducted among SEO professionals. They were asked to rate the main ranking factors. Here are some of the key findings. Local SEO has changed over the past 3 years but you’ll notice that link building and link signals along with proper and corroborating on page signals are still top factors in both the Local Pack and Organic listings. As per the chart above, this combination of factors accounts for between 30% – 50%+ of the results for clients. If your business has been around for a while, it will take a lot more effort. You can start by reviewing Google Analytics and checking the source of the traffic to your site and see if it is converting. Are your blogs up to date? Are you regularly uploading quality content? These are only a couple of things you should be paying attention to regarding your website. Know that GMB categories are a ranking factor and, therefore, it is often manipulated. Ho wever, GMB related spam can be reported on Google Maps or escalated to Google via their various support channels, so if you see anyone misusing it, you should report it. If you have a WordPress site or manage one for others, then you need to immediately check the PHP version of the site. The PHP versions 5.6 & 7.0 will no longer receive security patch starting December 31st & December 3rd respectively, which makes them very prone to hacking. WordPress has released data which shows that most of the sites are built on these two or even older versions of the PHP. Only a few sites are using 7.1 or a higher version of the PHP. If you are not sure how to check the version of the PHP your site is built on, you can simply contact your hosting company. Alternatively, you can install this PHP plugin to see. Be informed that updating your PHP is not that complicated. However, the outdated plug-ins & themes can make it a bit daunting. Therefore, we advise you to back up your website before making any changes. Not all the plug-ins that you are currently using will be compatible with the latest version of the PHP – that is 7.1 & higher. Before you begin the upgrade, make sure you identify all the plug-ins and themes that can be updated and remove those that are not compatible with the latest version of the PHP. Any plug-ins that are not compatible with the latest version of PHP will pose a security threat. The PHP compatibility checker will help with that. Create a full backup of your WordPress site. Check plug-in compatibility with new PHP versions. Find an alternative to those plug-ins that can’t be updated. Go to your web hosting control panel & click on the PHP section. If you are stuck anywhere between any of these steps, make sure to reach out to your hosting provider and ask them your specific question. Alternatively, you can also reach out to us. Our expert team will be more than happy to assist you. Google announced last month that they are launching a new Google My Business App that provides a host of features that can help owners of small businesses to easily manage their online presence and respond to customers. Google has made it extremely easy to upload photos, create offers and create events by adding a post button. You can also update information about your business from the profile tab and it will instantly appear on the search as well as the map. People can connect with you in many ways. They can message you, follow you, book a service or leave a review. From now on, you can see all of these in one place – the new customer tab. You can also respond to the reviews & post offers you will get a notification when you get a new customer connection. Also, you will soon be able to respond to messages directly from the app. The data that matters to you the most is now on the home screen itself. You can now check how many new people have interacted with your business, new connections and more, all in one place. Here’s a short video: . Google My Business App is a very powerful tool that every business owner and SEO professional must have. It’s easy to use and it offers a lot of gadgets that make tracking, analyzing and making changes easier. The other big news is that Google is about to launch a chat feature for Maps through which users can talk directly with business owners after searching for their business. Having the GMB app will help you with this feature as well. Google is sending emails to site owners who are struggling with site speed via the Google Search Console. The intention is to help them identify and fix the slow loading pages. Here’s the email. “Google has noticed that your site’s performance is significantly below average. Real user measurement data from the Chrome User Experience Report shows that pages on your site are slow to become interactive. This can have a severe negative effort on your business metrics and can cause user frustration. Our takeaway: Speed is crucial for both mobile and desktop versions of your site and it is officially part of the algorithm. It not only helps you with your SEO efforts, but also massively boosts the user experience since most of the users want a fast loading page. Site speed translates into better ranking and it also directly boosts the conversion rate. Hence, it is a very crucial aspect of your site which you should be paying attention to. In order to help YouTube advertisers drive more conversions, Google added new features that combine the power of YouTube’s creative canvas with Google’s machine learning and measurement solution. YouTube advertisers soon will be able to use a wide variety of ad extensions, so that they can provide interesting information and compel the audience to take actions. Google now wants to encourage viewers to complete a lower funnel action, i.e. : booking flights, downloading apps etc. and for that, they are testing additional use cases. Google also wants to enable YouTube advertisers to measure the full impact of their video campaigns by evolving Brand Lift. They are also partnering with IRI so that it will get easier for the advertisers to act upon upper and lower funnel metrics. They also have introduced new metrics: Lifted Users: To know the estimated number of users whose perception changed after seeing your ads. Cost-per-lifted-users: To know the average cost of the lifted users. Google also added that in order to utilize this new measurement tools to the fullest, you should use Maximize Lift bidding. Furthermore, Google is investing heavily in Google Measurement Partners to ensure that the measurements you receive are authentic and not exaggerated. Google said that it’s their topmost priority to provide measurements that advertisers can trust, as it is crucial to their overall advertising efforts. Since Facebook drastically exaggerated activity reports (as much as 900%), having a measurement that you can trust is vital to the success of the ad campaigns. Google also announced their “New MRC accreditations and partners for Google and YouTube ads measurement”. If you are a big brand, then you surely want to check all the new measurement tools and metrics that YouTube has to offer in order to get the most out of your YouTube ad campaigns. Sometimes, the first impression is not the last impression. For example, you go to a restaurant and don’t receive the type of service you expected so, you leave a negative review. However, upon a second visit, their service matches your expectations and you want to update the review but, don’t want to do it manually. The question is, will it lead to more review edits? It’s very unlikely. The percentage of people who update reviews is very low.